Harry Potter and the Cursed Child is an original play by John Tiffany, Jack Thorne and J.K. Rowling. 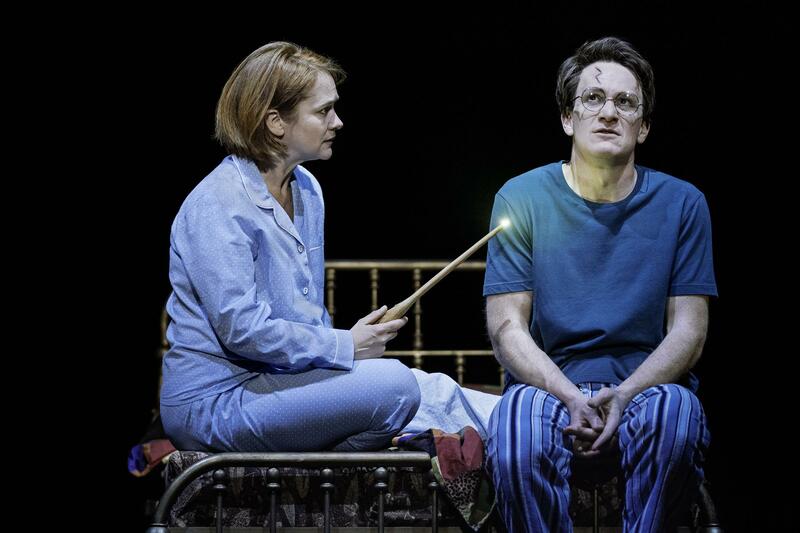 Jamie Parker plays Harry Potter, and Poppy Miller plays his wife, Ginny, in Harry Potter and the Cursed Child. "You don't need millions of dollars to stage a CGI-fest," says actor Jamie Parker. He plays a grown-up Harry Potter in a story that picks up where the last novel left off, with Harry sending his son off to Hogwarts. Producers aimed to seduce the audience into seeing what the director wanted them to see, so suitcases become seats on the Hogwarts Express, and a young actor becomes an adult with the help of Polyjuice Potion and a big cloak. Many of the tricks are simple stage illusions, or "rough magic," as director John Tiffany calls them. "I could just smell the fact that cloaks and suitcases were going to tell our story beautifully," Tiffany says. "And I loved the idea that we were doing things that kids could also do at home when they do their version of the story." Jack Thorne, who wrote the play, is thrilled by this approach. He says, "My favorite moment in the play has no dialogue in it, sadly. And it's a staircase dance, and you just see two boys and two staircases, and the staircases are openly being pushed around by members of the company. Everyone can see what's happening onstage, there's no pretense about it. And you see the staircases and the boys interact in an emotionally significant way that tells the story of what's happening to these kids." Cursed Child is an original play, not a stage adaptation. (Author J.K. Rowling consistently rejected overtures to adapt her novels.) "She decided that this should be called the eighth 'story,' " Tiffany says, "and that it should be classed as canon and in some ways this would be her last word on Harry Potter as a character." Tiffany, Thorne and Rowling collaborated on the story, which the producers have gone to great lengths to protect. They won't release any scenes to the media, and audiences are given buttons that say #KeeptheSecrets. (Actor Jamie Parker had to sign a nondisclosure agreement when he got hired to do a reading.) But the script is available in bookstores and, at this point, pretty much anyone who cares knows what the play is about. Tiffany says it's as epic as the books, and insists he never worried it couldn't be staged. "I absolutely believe and know that theater can do anything. If you harness the audience, and if you ask just enough of them, and if they're willing to come with you, then they will make believe that anything is happening." 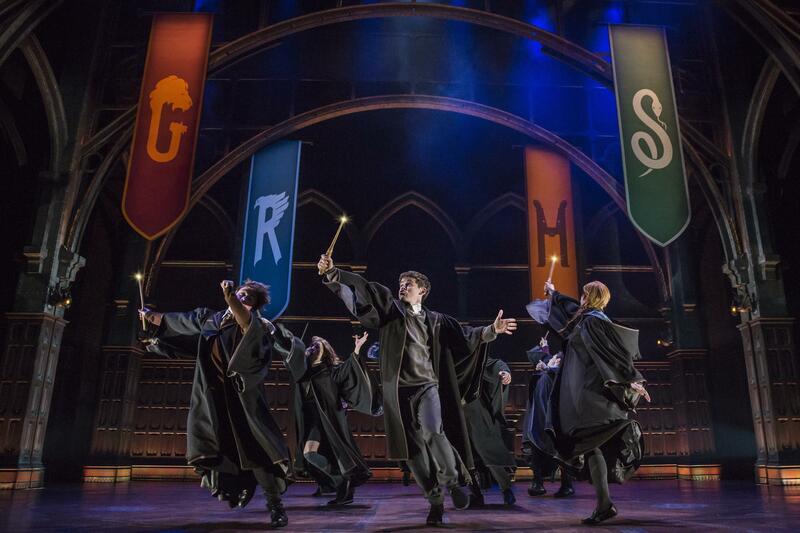 As for the producers, they believed Harry Potter's immense popularity would bring in new theater audiences. Producer Sonia Friedman says, "In our first couple of years in London, over 60 percent of our audience [were] first-time theatergoers." That sounds a lot like 9-year-old Domenic Simionetti, who attended a recent matinee (his first play) with his mom. He wore a cloak, just like Harry Potter. "I saw the special effects and I thought they looked really cool," he said, "because I've never seen special effects like that, only in movies." Tom Cole edited this story for broadcast. Nicole Cohen adapted it for the Web. The most expensive nonmusical play in Broadway history opened last night. At more than $33 million, it runs 5 1/2 hours in two parts. It costs more than the recent extravaganza "Frozen." 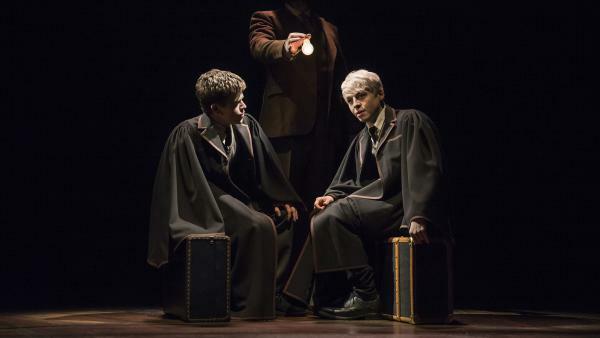 We are of course talking about "Harry Potter And The Cursed Child." Jeff Lunden reports that while there are plenty of special effects in this show, the creators want audiences to use their imagination. JEFF LUNDEN, BYLINE: After a recent matinee Domenic Simonetti, a 9-year-old from Maplewood, N.J., left the theater with his mom. He was wearing a cloak just like Harry Potter. DOMENIC SIMONETTI: I read the whole series. We just finished it, so my mom accidentally buy tickets to the play and we went. LUNDEN: It wasn't really an accident, and Domenic's mom was taking him to see his very first play. He loved how actors in cloaks just like his made the sets magically disappear during scene changes. DOMENIC: They were, like, swishing their cloaks around to make it look like they were blending in with everything else. LUNDEN: It's what director John Tiffany calls rough magic. JOHN TIFFANY: I could just smell the fact that cloaks and suitcases were going to tell our story beautifully. And I loved the idea that we were doing things that kids could also do at home when they do their version of the story. LUNDEN: So the suitcases become seats on the Hogwarts Express, and a young actor becomes an adult with the help of polyjuice potion and a big cloak. In fact, many of the tricks are simple stage illusions. TIFFANY: You don't need millions of dollars to stage a, you know, CGI fest. LUNDEN: Despite the fact that producers did spend millions of dollars actor Jamie Parker, who plays the adult Harry Potter, says they wanted to seduce the audience into not seeing what the director doesn't want them to see. JAMIE PARKER: We're not going to pretend that this is anything other than theater. So it's about you seeing what you want to see. And, you know, work your thoughts. Fill in the gaps. LUNDEN: And despite the fact that he wrote the play, Jack Thorne says he's thrilled by this approach. JACK THORNE: My favorite moment in the play has no dialogue in it sadly. And it's the staircase dance. And you just see two boys and two staircases. And the staircases are openly being pushed around by members of the company. Everyone can see what's happening onstage. There's no pretense about it. And you see the staircases and the boys interacting in an emotionally significant way that tells the story of what's happening to these kids. LUNDEN: OK, the story - this is not a stage adaptation of the books. In fact, author J.K. Rowling consistently rejected overtures to adapt her novels, says director John Tiffany. TIFFANY: Very quickly she decided that this should be called the eighth story and that it should be classed as canon. And in some ways, this will be her last word on Harry Potter as a character. PARKER: Yeah, I sat in a small room about like this, signed an NDA, a non-disclosure agreement. LUNDEN: Producers have provided some incidental music by Imogen Heap. LUNDEN: At this point, pretty much anyone who cares knows that the play picks up where the last novel ended with the adult Harry sending his son off to Hogwarts. Director John Tiffany says the play is as epic as the books and insists that he never worried that it couldn't be staged. TIFFANY: I absolutely believe and know that theater can do anything. If you harness the audience, and if you ask just enough of them, and if they're willing to come with you, then they will make believe that anything is happening. LUNDEN: And the producers believed that the immense popularity of the books and movies would bring in new theater audiences, says producer Sonia Friedman. SONIA FRIEDMAN: In our first couple of years in London, over 60 percent of our audience are first-time theatergoers. LUNDEN: Like Domenic, the boy in the cloak seeing his very first Broadway show. DOMENIC: I saw all the special effects, and I thought they were really cool because I'd never seen special effects like that - only in movies. And they made the chairs fly around and stuff. LUNDEN: With some rough magic and $33 1/2 million. For NPR News, I'm Jeff Lunden in New York.